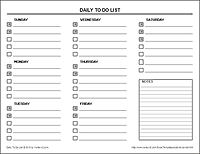 The purpose of this daily to do list is to spread out all of the things you want or need to get done throughout the week. This will allow you to focus on the tasks at hand rather than worrying about a large list of to-dos that couldn't possibly all get done in one day. In addition, we've marked the first couple of to-dos for each day with a star to emphasize that they are your top priorities for that day. Maybe you can't complete everything, but those are the items you need to get done most. 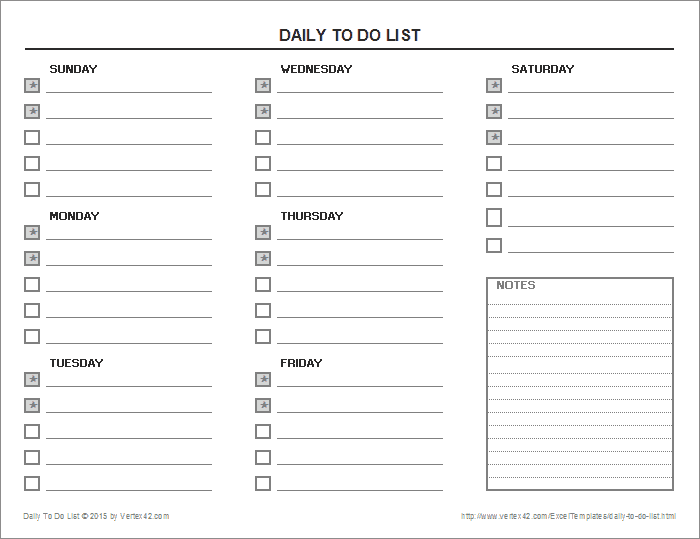 This method of tracking your to-dos can help you avoid feeling overwhelmed each day with too many tasks. It also allows you to feel the great sense of achievement throughout the week as you check off the items you've completed. 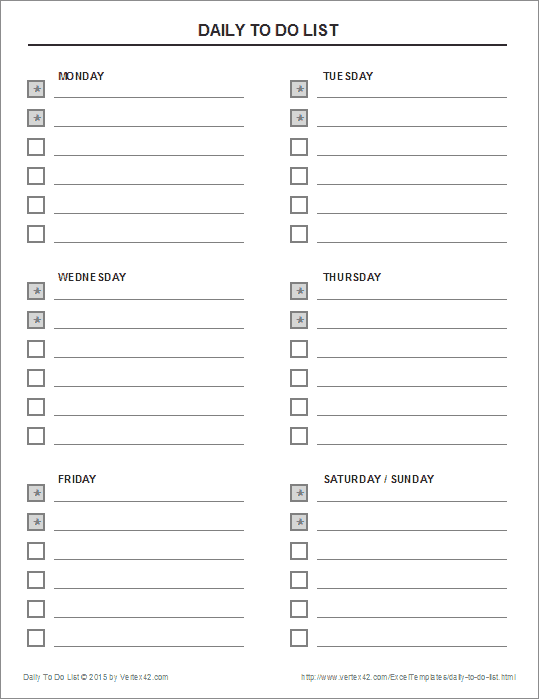 If you like these templates exactly as they are, you can quickly download the PDF files below and print as many copies as you need. This spreadsheet contains two layouts for a daily to do list. The first is in portrait orientation and combines Saturday and Sunday. The second is a landscape layout that has spot for notes and a larger space for your Saturday to-dos, which can come in handy if you're someone who has a lot of weekend tasks. You can use the notes area for writing down appointments and family events scheduled during the week. To change the color scheme of this template, all you need to do is go to Page Layout > Colors and select a different set of theme colors. The spreadsheet is currently using a gray theme. If you would like to use this gray theme for other templates downloaded from Vertex42.com, open the template then go to Page Layout > Colors > Create New Theme Colors and enter a name for the current set of colors such as "Vertex42-Gray" and click OK.